I had this great post all written about territorial wars between the birds on our property. “What happened to it?” you might ask. I have no idea. None. Zip. One of those computer thingies that just happens sometimes. I was editing it on my laptop and I apparently hit a wrong key and it all disappeared. But that wouldn’t bring my post back. So instead, I’m posting this rather sparse post of a few, not really very good photos. 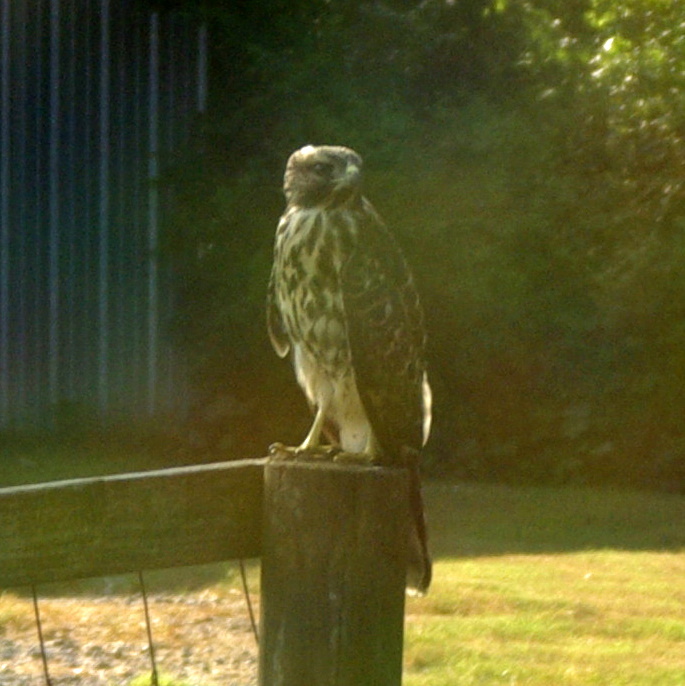 This is one of two immature red shouldered hawks who have been having territorial wars in our back yard. Their parents were here last week. One day I got to see one of the parent hawks bring food for this hawk. The piece that I lost described in great detail all of the many battles that have occurred during the Bird Wars of NW Georgia. Disappeared into the nether regions of this computer. It is much too late in the day to try to rewrite the whole thing. In fact, at the moment I am a bit tired of the whole subject. I’m going to leave this stinkin’ computer before I pitch it out the window. I’m going outside to listen to my hawks screech at each other as the battle for territory continues. If you want to know what is sounds like, go here. I have an earlier rough draft. I might try to rewrite it another day. So, anyway this is my fingerprint of God. Perhaps He thought I should keep it simple. 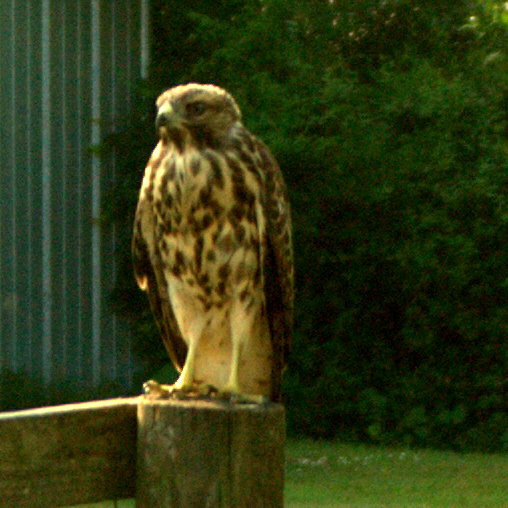 So simply put, Immature Red Shouldered Hawks and their parents are my fingerprint this week. They are really cool birds. I’ll tell you all it about it one day. But it won’t be written on this laptop. Have a good 4th of July. Remember freedom is not free. It wasn’t in 1776 and it’s not now. Next Post America…Sweet Name of Freedom! SO sorry that happened! It's still a good post. It IS still a good post. I would love to hear about the bird wars though, sometime when the computer battle is over…. P.S. I also use Cornell's ornithology lab. It's one of my favorites. We live only 35 miles from it. It's just a crow's flight across Seneca Lake from us. Beautiful spot, lovely trails. I was thinking of going there soon and doing a blog post about it. What gorgeous, majestic looking creatures! You are so blessed to have them in your back yard, even if they are at war. They certainly are a fingerprint of God. Your photos are breathtaking and the complete version of your story must be just as fascinating. I hope you do rewrite it someday, but I do know how you feel. If I had a nickel for everything my computer ate up I would have enough money to buy a new computer! Arrrrrrrgh I know of your frustration. The photos are wonderful. Happy 4th! How cool is that to be able to watch the bird wars! I have had that happen often to me since I work a lot on the laptop. I found that if I immediately hit the undo button it pops back! Oh Vicki I've been there with the computer thing. It can be totally infuriating! I hate all of the time and effort that gets wasted but on we go! 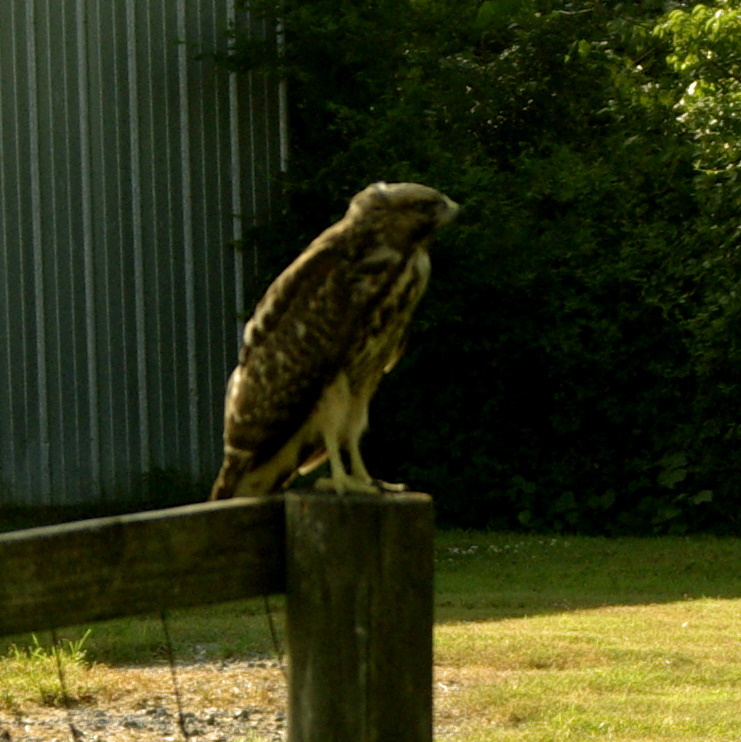 I think that I would be afraid to go into my yard with the Hawk wars going on! I'd wear a helmet at least! LOL!